Proton NMR spectroscopy of solids has traditionally been challenging due to the widespread presence of strong 1H-1H dipolar couplings in solid systems, which severely broaden proton NMR spectral lines and result in the loss of chemical resolution. Nonetheless, recent developments in magic-angle-spinning (MAS) NMR probe technology and solid-state NMR methodology have provided excellent opportunities for significant improvements in the resolution of 1H NMR spectra of solids. As a result, proton NMR spectroscopy has emerged as a valuable tool for obtaining atomic-level insights into the molecular structures and dynamics in various challenging systems. 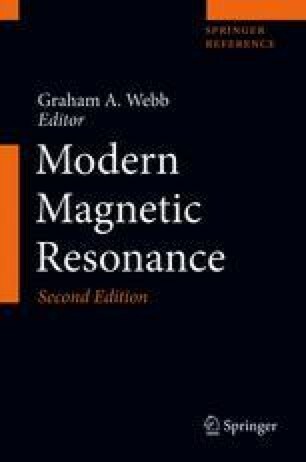 In this chapter, proton-based solid-state NMR strategies for achieving high spectral resolution will be reviewed in conjunction with their applications to various challenging systems. Three different solid-state NMR approaches to enhance the proton spectral resolution are covered in this chapter: combined rotation and multiple pulse spectroscopy (CRAMPS), high-resolution MAS spectroscopy (HRMAS), and ultrafast MAS (UFMAS). CRAMPS technique is often used for enhancing spectral resolution at slow spinning rates, whereas HRMAS has been used in the study of semisolids such as membrane mimetics including bicelles and nanodiscs, liquid crystalline materials, tissues, and biospecimens. Thanks to the recent NMR hardware and methodology advances, UFMAS experiments are increasingly applied to obtain ultrahigh resolution proton spectra of various challenging materials. Due to the high gyromagnetic ratio, high natural-abundance and prevalence of protons in various systems, it is expected that proton NMR spectroscopy will play more significant roles in the investigation of molecular structures and dynamics. We acknowledge the financial support from the National Institutes of Health (to A.R.). We would like to thank Dr. Yusuke Nishiyama and JEOL RESONANCE for fruitful collaborations in the development of ultrafast-MAS techniques using a 0.75 mm 120 kHz MAS probe.